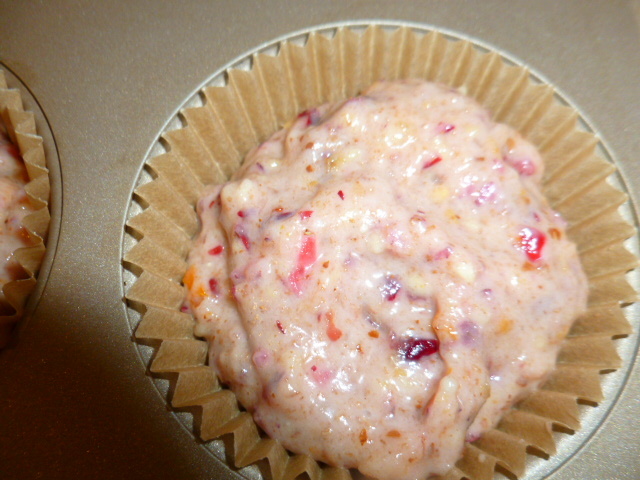 The result is these tasty, colorful, fragrant and moist muffins, which are very easy to make. They are not too sweet and get a great texture from the bananas and the roughly chopped almonds. Their nutritional value makes them perfect for a quick breakfast, which includes lots of fiber and all the goodness such fresh ingredients can offer. 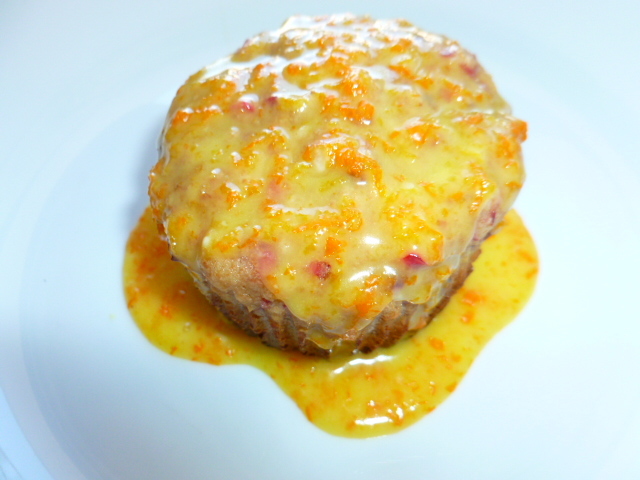 The muffins also make a great snack, and, if you coat them with orange icing, can be served as a light dessert for brunch. * The amount may seem fairly large, but no need to hesitate about making them, as they keep well in the freezer. For best texture after freezing, place a frozen muffin in the fridge the night before, and in the morning all you’ll need to do is slightly warm it. 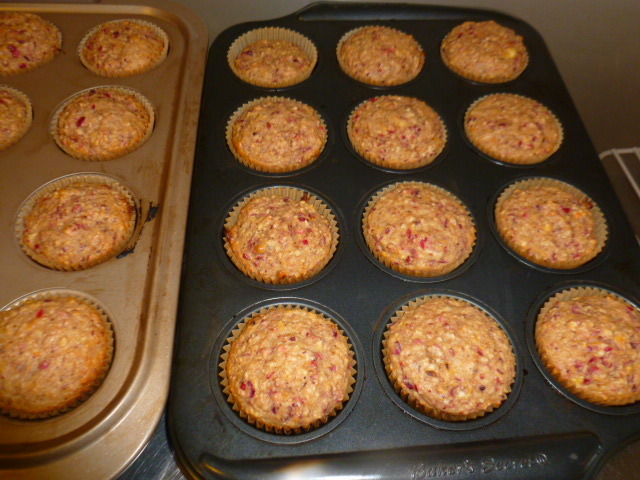 * If you prefer sweeter muffins, increase the amount of sugar up to 1 ½ cups. Brown sugar can be used instead of white, but the color will not be as nice. * The icing gets its intense color from orange zest only! 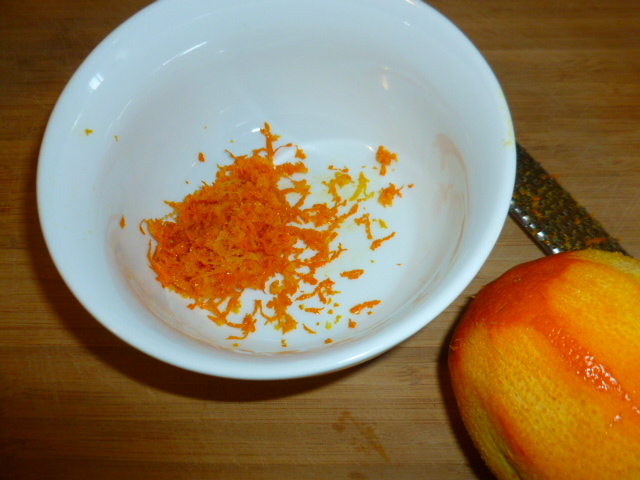 It is quite surprising to see how much color one tablespoon of orange zest can produce. 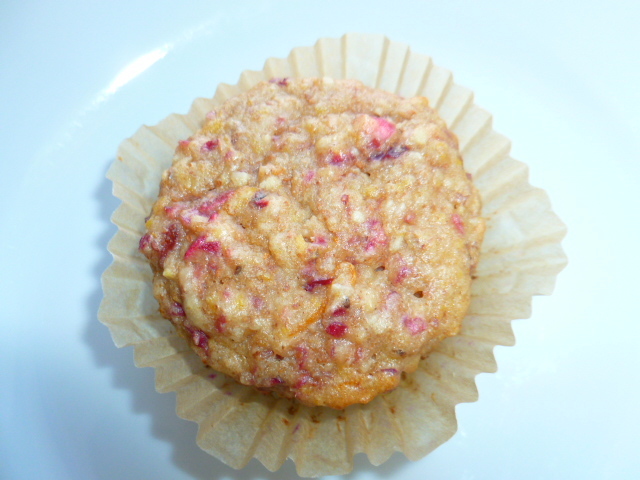 For another tasty icing option, try the CRANBERRY ICING IN THIS POST. 1. Preheat the oven to 350F (175C). 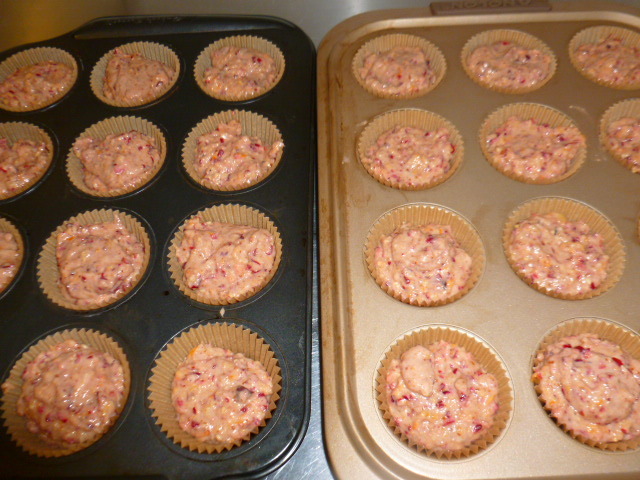 Place 24 paper baking cups in two muffin baking trays. 2. 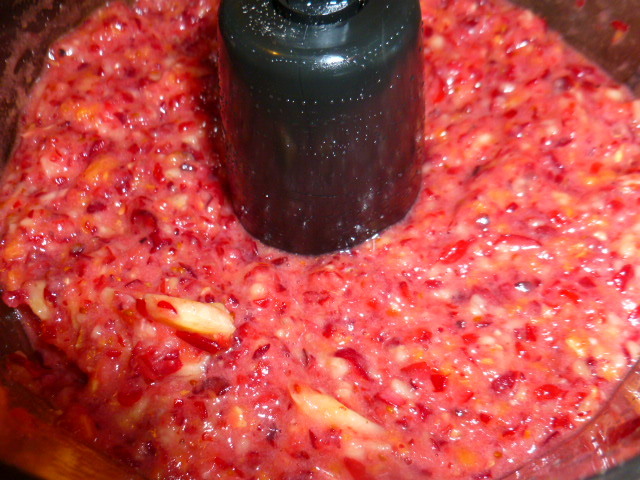 In a food processor with the metal blade, process the almonds to a coarse meal. Transfer to a bowl and keep on the side. 3. Grate the orange zest and measure 2 Tbs. (Keep the rest for the icing.) 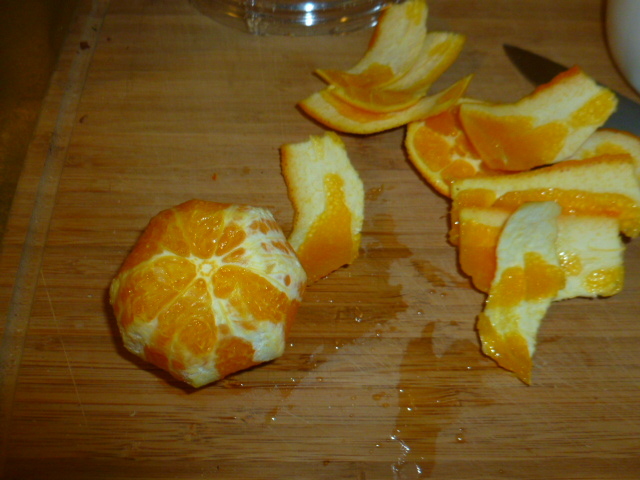 With a sharp knife, cut off both ends of the orange and the peel. Cut into thick slices. 4. 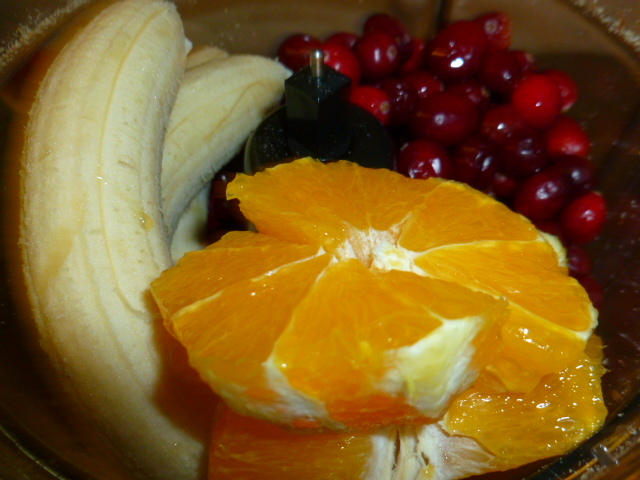 Add the cranberries, bananas and sliced orange to the food processor bowl and blend together to a coarse mixture. 5. 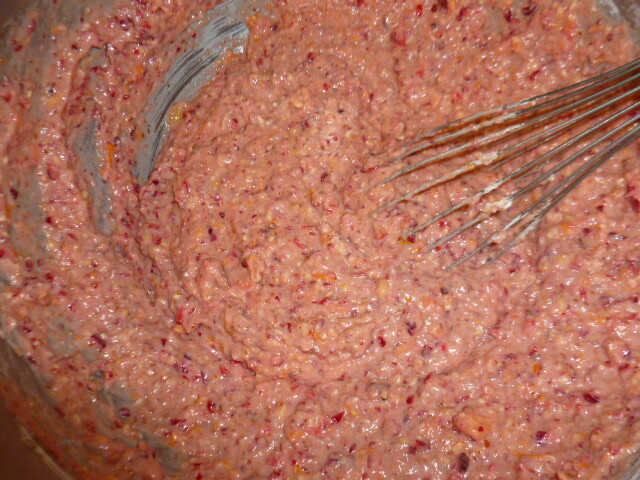 Transfer to a large bowl and add the sugar, oil and eggs. 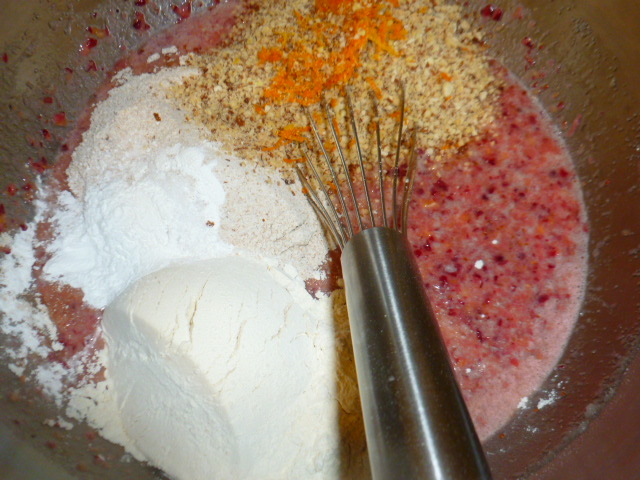 Whisk well and add the almond meal, flours, baking powder, salt and orange zest. Whisk lightly to an even batter and fill the baking cups. 6. 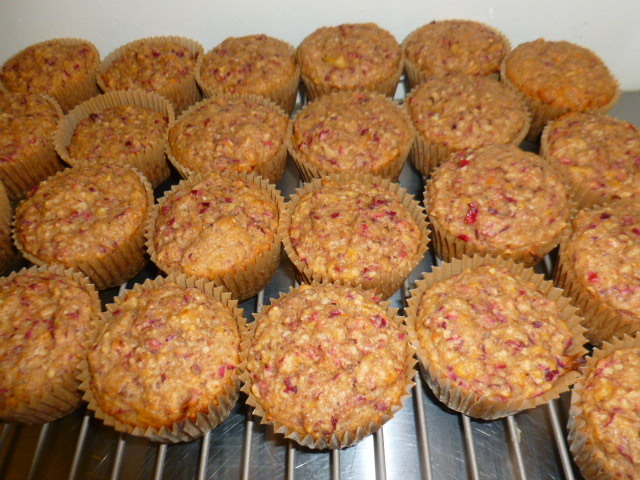 Bake for 28 minutes, or until a toothpick inserted in the center of one muffin comes out almost dry. Transfer to a rack and let cool to room temperature. 7. 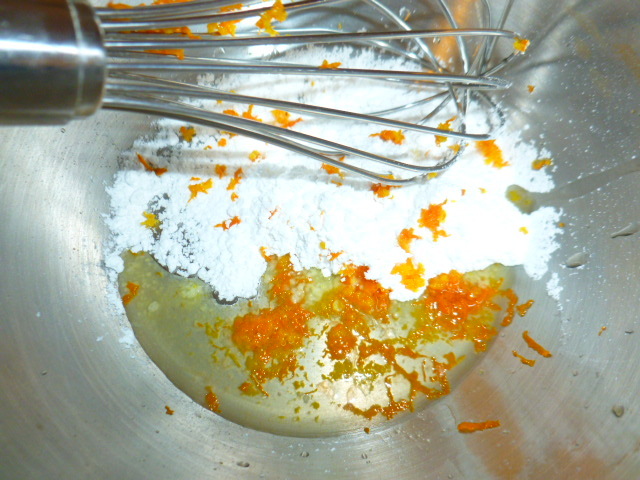 The icing: place the orange juice and zest in a bowl. Add the powdered sugar and whisk to a thick yet runny consistency. Pour over the cupcakes and let set before serving. * The unglazed cupcakes can be frozen, in an airtight container, for up to a month. The glazed ones will keep in the fridge for up to 3 days. I’m still hoarding a bag of cranberries in the freezer, and oranges are here now, too. I’ll have no excuse not to make a batch of these to take on outings. The muffins are loaded! I like your butter-free icing recipe too. Yummy!!! So fruity, I love the flavours!! These look so fresh and delicious! I love the combo of flavors! yum! These look tasty :-) Loving the combination of flavors and textures. Must make for breakfast. Gee, Ronit. 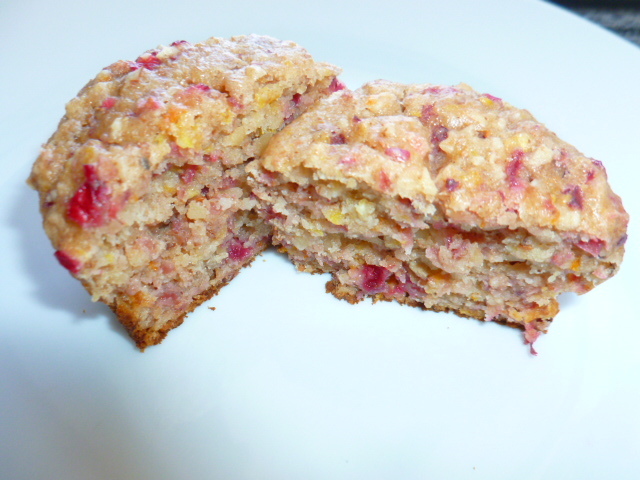 These muffins sure are chock-full of goodies! They’d be perfect for breakfast. Adding the orange flavoured icing would be divine!! 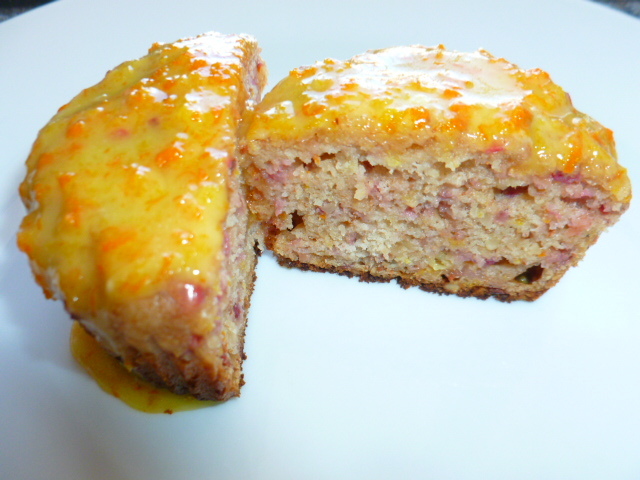 The orange icing really adds a lot – in flavor, and with the color and aroma the zest produced. Hai!! Lovely blog will try this recipe soon!! Wow, these look amazing! I just showed this post to my fiance and he wants me to make them asap! Hope you’ll both enjoy the results and I’ll be happy to have your comments. Delicious muffins. Great for snacks! thanks for sharing!